An interval is the distance between two notes on a bass guitar. For example, in the scale of C, the distance from the root C up to F is four notes (C, D, E, F), so the interval is called a 4th. When you identify an interval, you count the original note (C in this example) as well as the final note (F). 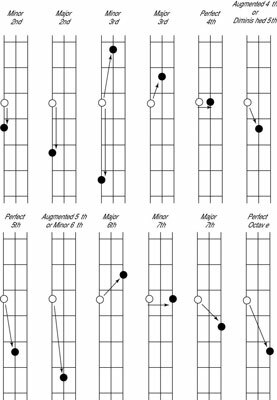 Musicians communicate with interval terminology: “Hey, try a 4th instead of the 5th on the G chord,” which means: Play the G with a C (an interval of a 4th) instead of the G with a D (an interval of a 5th). So recognizing intervals clearly is important. The intervals are always in the same configuration; a 4th, for example, always looks and feels the same, regardless of what key it’s in. Take a look at the names and configurations of each interval. The open circle is the note you’re measuring the distance from; the small black dot is the interval. You can find them on your own by feeling them with your hand (again, covering one finger per fret). When you get comfortable with how they feel, you’ll have an easier time applying them to your playing. You can cover all the intervals with only three strings at your disposal.